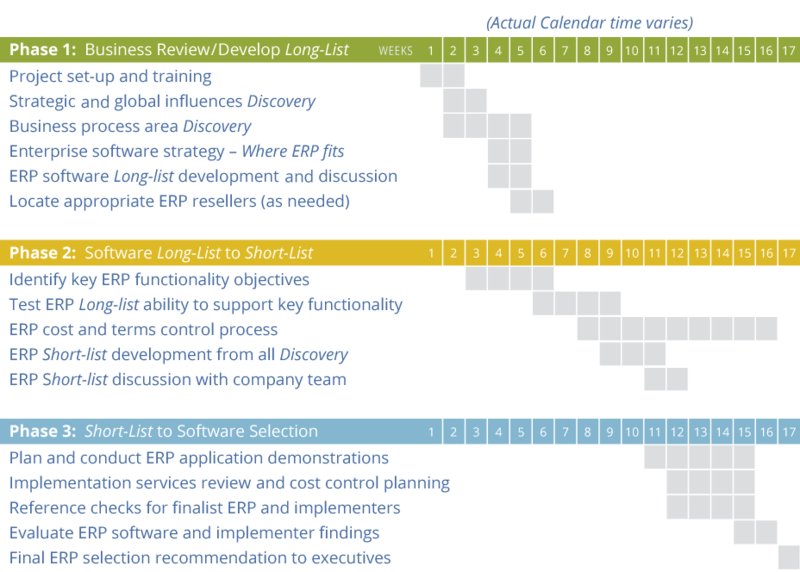 The SoftSelect ERP selection process has been built from the lessons learned in more than 900 ERP projects since 1996. The resultant formalized methods and tools enable our team to deliver effective services with about half the typical consulting hours required to reach similar results. The SoftSelect methods and tools are not a cookie cutter approach, but are adapted to each client’s unique project. The ERP Selection Details page expands upon the steps listed in the chart below. For ERP selection projects, our consultant's key skill is experience in the business processes that ERP should support for a client project. Other important attributes or our ERP consultant team are: (1) ERP project experience, (2) knowledge of modern ERP tools and purpose, (3) complex project management skill, and (4) credibility and adaptability. With these skills, our ERP consultants can purposefully engage participants from shop floor employees to executives. Since 1996 to today, Engleman Associates, Inc.'s business model has been to collaborate with independent consultants. The current core team has on the average about ten years of working together. Our ERP selection consulting firm offers a highly coordinated team, based on experience, trust, and common methods. Our company maintains formal and qualitative information on ERP programs and other business software types such as CRM, MES, WMS, and PLM. Our ERP consultant team interacts with the ERP sellers and other business software professionals in day-to-day project work. This has been the primary method by which we stay current with the relative strengths and weaknesses of these business software products. This ERP information, plus client-specific screening factors, is what influences the ERP software long-list we recommend to a client. Our company has no formal relationship with any software vendor—for any financial or other purpose. The sole focus of our enterprise resource planning consultant team is the ERP buyer’s interests. Review our ERP Comparison Database.